What is an email loop? Automatic response to emails is common in modern software that handles emails. Out of office responders, Requester notified of the request are few common examples of automatic responses sent by mailboxes. If one such automatic response triggers another automatic response on the other side, an email Loop/War is created. This loop can prolong indefinitely till someone intervenes and breaks the loop. While email loops are still around these days, they are fairly uncommon - due to continual changes in the way email software work. 📨 Certain mailboxes automatically recognize the autoresponder emails from HappyFox from the email headers and prevent looping by stop sending their autoresponder emails response back to HappyFox. 🛡️ In an effort to combat Looping, HappyFox limits a maximum of 5 new ticket autoresponders to be sent in an interval of 5 minutes for tickets found to be being raised by the same contact. What to do in case of an eventual Loop? Ascertain which autoresponder/notification from HappyFox's is contributing to the loop. Visit Manage >> Notifications to see the list of enabled notifications. HappyFox creates a new ticket on the details provided by the customer. HappyFox sends a “New ticket Auto-responder” notification to the contact. Contact’s mailbox sends a OOO responder email back to HappyFox. 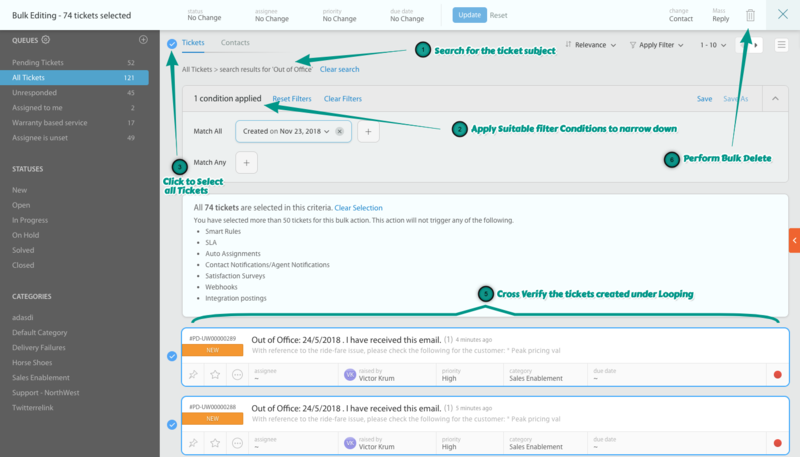 A ticket is created inside HappyFox with the OOO details. In this case, “New ticket Auto-responder” is contributing to the email loop. In the event of a case where a lot of “Replies” from an agent are getting created instead of tickets, then, “Agent new reply” is contributing towards the email loop. Step 2: Temporarily disable the corresponding autoresponder/notification and then re-enable it. Once you've identified the autoresponder that is causing the looping, you should disable temporarily for the category you've received the tickets under. You can re-enable the notification once the looping has evidently stopped. Step 3: Cleanup the unwanted tickets using Bulk Action 🗑️. You can use a combination of filters and search to narrow down the tickets that were created inadvertently. Then, proceed to use Bulk actions to delete the unnecessary tickets permanently.